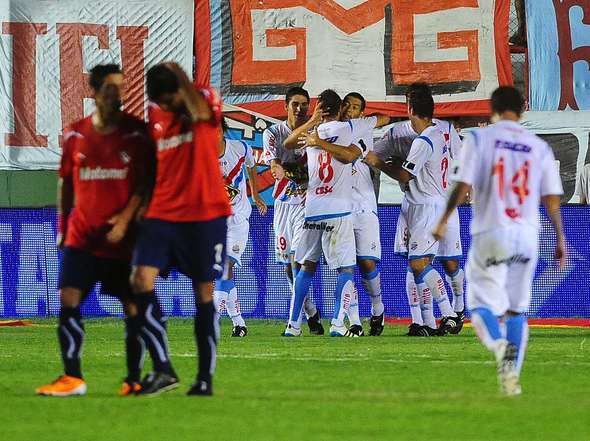 Arsenal hosted Independiente in Sarandí on Monday night in the final match of the fourth round of the 2011 Torneo Clausura, and the result, yet again, was a loss for the Avellaneda giants. Independiente are now closing in on a full short championship without a win, and are already being drawn into a relegation battle. Luciano Leguizamón’s goal, which made it 3-0 to Arsenal, means he’s overtaken José Luis Calderón as Arsenal’s all-time top scorer in the top flight. You can watch the goals here, as well as seeing all the scores and goalscorers from the round now finished. Hand Of Pod 10: Pastore transfer talk, & River Plate the ‘South American Barcelona’? Did Independiente borrowed Huracan’s shirts for the game and even scored a goal that was disallowed, and where the other two goals form Arsenal? Oh, we got the wrong game on, I see. First of all, sarcasm is not appreciated. If you think a mistake’s been made, please point it out politely. Secondly, I’ve just viewed the video above again, both here and on YouTube, and at my end it’s showing up as a video of Arsenal’s 3-0 win over Independiente, with both teams in the correct kits and no disallowed goals shown. There’s a banner ad for senti-futbol.com.ar along the bottom, which presumably is the site of the YT user who uploaded it. Sorry about that mate. Didn’t mean to offend. I guess I was a bit tired and did not pay attention. It works well now, Thanks. Well, set your sights to next week for the return of The Ricky ‘Hollywood’ Lombardi Show™ on TVPublica. All kidding aside, ricky has been able to get struggling teams points they would otherwise not obtain.